Heat oven to 350°F. Line 3 cookie sheets with cooking parchment paper. Unroll 1 dough sheet on work surface. Cut dough in half; cut each half into 9 strips. Place strips on 1 cookie sheet; refrigerate until ready to use. Unroll remaining dough sheets. Place 4 1/2-inch round biscuit cutter on dough; place 3 1/2-inch round biscuit cutter inside larger cutter. Cut out thin 4 1/2-inch ring of dough between cutters. Repeat process, making a total of 6 large dough rings. Place on cookie sheet; refrigerate. Place 2 1/2-inch round biscuit cutter on dough; place 1 1/2-inch round biscuit cutter inside larger cutter. Cut out thin 2 1/2-inch ring of dough between cutters. Repeat process, making a total of 6 medium dough rings. Place 1 1/2-inch round cutter on dough; place 1-inch round cutter inside larger cutter. Cut out thin 1 1/2-inch ring of dough between cutters. Repeat process, making a total of 6 small dough rings. Cut out 6 tiny circles from remaining dough. In 3-quart saucepan, mix chicken, peas, corn, milk and soup. Cook over medium heat until bubbly; stir in cheese and sour cream. Spoon 3/4 cup hot chicken mixture into each of 6 (1-cup) individual baking dishes (ramekins) or custard cups. Place cups at least 4 inches apart on 2 cookie sheets. Place 3 dough strips crisscrossing over rim of each pot pie to look like spider legs, with ends extending onto cookie sheet. Onto each pot pie, place large, medium and small dough rings. Place tiny dough circle in center of each. Bake 20 minutes or until crust is golden brown. Cut each olive in half; set aside 6 olive halves for spider bodies. Cut remaining olive pieces into 48 small pieces for spider legs. 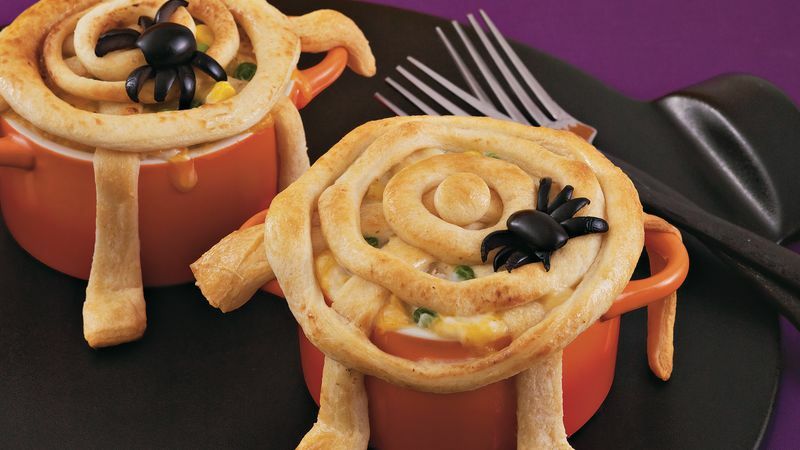 Arrange olive half and 8 pieces on each pot pie to look like a spider.